Weather and Ice Causing Issues/Delays for RTA. If there is a way not to have to travel today, it is advised that people stay inside and out of the elements! 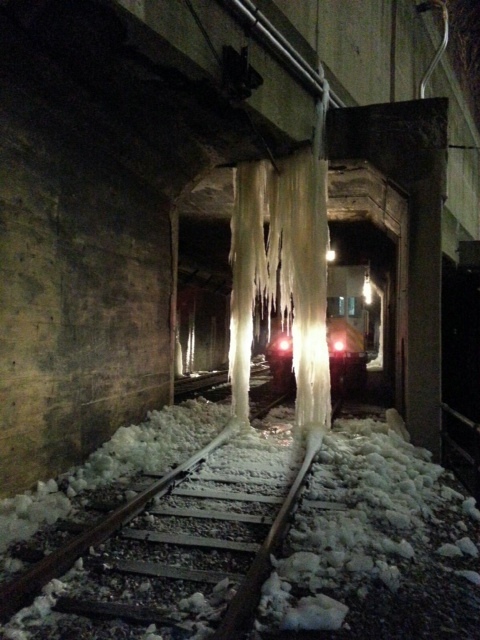 This is a good visual of how the ice is causing major issues for RTA. This was taken this morning at the Tower City rapid station. RTA is doing their best to get things safe for operations again. At this time, the entire Red Line Rapid system is served by buses. The Blue/Green/Waterfront Lines are back on schedule. There are very few trains and buses available for service now due to a significant number of them being disabled by the cold weather and/or ice. If there is a way to not have to travel today, it is advised that people stay inside and out of the elements.